In the distant, young universe, quasars shine with a brilliance unmatched by anything in the local cosmos. Although they appear starlike in optical telescopes, quasars are actually the bright centers of galaxies located billions of light-years from Earth. The seething core of a quasar currently is pictured as containing a disk of hot gas spiraling into a supermassive black hole. Some of that gas is forcefully ejected outward in two opposing jets at nearly the speed of light. Theorists struggle to understand the physics of the accretion disk and jets, while observers struggle to peer into the quasar's heart. The central "engine" powering the jets is difficult to study telescopically because the region is so compact and Earth observers are so far away. Astronomer Rudy Schild of the Harvard-Smithsonian Center for Astrophysics (CfA) and his colleagues studied the quasar known as Q0957+561, located about 9 billion light-years from Earth in the direction of the constellation Ursa Major, near the Big Dipper. This quasar holds a central compact object containing as much mass as 3-4 billion Suns. Most would consider that object to be a "black hole," but Schild's research suggests otherwise. "We don't call this object a black hole because we have found evidence that it contains an internally anchored magnetic field that penetrates right through the surface of the collapsed central object, and that interacts with the quasar environment," commented Schild. The researchers chose Q0957+561 for its association with a natural cosmic lens. The gravity of a nearby galaxy bends space, forming two images of the distant quasar and magnifying its light. Stars and planets within the nearby galaxy also affect the quasar's light, causing small fluctuations in brightness (in a process called "microlensing") when they drift into the line of sight between Earth and the quasar. Schild monitored the quasar's brightness for 20 years, and led an international consortium of observers operating 14 telescopes to keep the object under steady around-the-clock watch at critical times. "With microlensing, we can discern more detail from this so-called 'black hole' two-thirds of the way to the edge of the visible universe than we can from the black hole at the center of the Milky Way," said Schild. Through careful analysis, the team teased out details about the quasar's core. For example, their calculations pinpointed the location where the jets form. "How and where do these jets form? Even after 60 years of radio observations, we had no answer. Now the evidence is in, and we know," said Schild. Schild and his colleagues found that the jets appear to emerge from two regions 1,000 astronomical units in size (about 25 times larger than the Pluto-Sun distance) located 8,000 astronomical units directly above the poles of the central compact object. (An astronomical unit is defined as the average distance from the Earth to the Sun, or 93 million miles.) However, that location would be expected only if the jets were powered by reconnecting magnetic field lines that were anchored to the rotating supermassive compact object within the quasar. 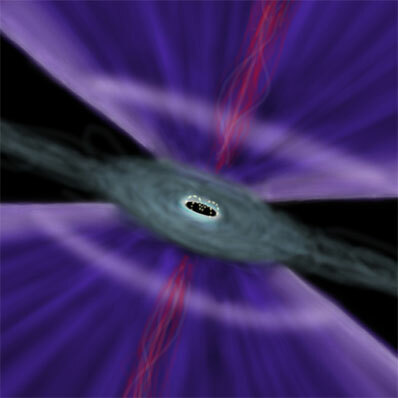 By interacting with a surrounding accretion disk, such spinning magnetic field lines spool up, winding tighter and tighter until they explosively unite, reconnect and break, releasing huge amounts of energy that power the jets. "This quasar appears to be dynamically dominated by a magnetic field internally anchored to its central, rotating supermassive compact object," stated Schild. Further evidence for the importance of the quasar's internally anchored magnetic field is found in surrounding structures. For example, the inner region closest to the quasar appears to have been swept clean of material. The inner edge of the accretion disk, located about 2,000 astronomical units from the central compact object, is heated to incandescence and glows brightly. Both effects are the physical signatures of a swirling, internal magnetic field being pulled around by the rotation of the central compact object - a phenomenon dubbed the "magnetic propeller effect." Observations also suggest the presence of a broad cone-shaped outflow from the accretion disk. Where lit by the central quasar, it shines in a ring-like outline known as the Elvis structure after Schild's CfA colleague, Martin Elvis, who theorized its existence. The surprisingly large angular opening of the outflow that is observed is best explained by the influence of an intrinsic magnetic field contained within the central compact object in this quasar. In light of these observations, Schild and his colleagues, Darryl Leiter (Marwood Astrophysics Research Center) and Stanley Robertson (Southwestern Oklahoma State University), have proposed a controversial theory that the magnetic field is intrinsic to the quasar's central, supermassive compact object, rather than only being part of the accretion disk as thought by most researchers. If confirmed, this theory would lead to a revolutionary new picture of quasar structure. "Our finding challenges the accepted view of black holes," said Leiter. "We've even proposed a new name for them - Magnetospheric Eternally Collapsing Objects, or MECOs," a variant of the name first coined by Indian astrophysicist Abhas Mitra in 1998. "Astrophysicists of 50 years ago did not have access to the modern understanding of quantum electrodynamics that is behind our new solutions to Einstein's original equations of relativity." This research suggests that, in addition to its mass and spin, the quasar's central compact object may have physical properties more like a highly redshifted, spinning magnetic dipole than like a black hole. For that reason, most approaching matter does not disappear forever, but instead feels the motor-like rotating magnetic field and gets spun back out. According to this theory, a MECO does not have an event horizon, so any matter that is able to get by the magnetic propeller is gradually slowed down and stopped at the MECO's highly redshifted surface, with just a weak signal connecting the radiation from that matter to a distant observer. That signal is very hard to observe and has not been detected from Q0957+561. This research was published in the July 2006 issue of the Astronomical Journal.